Case studies, whether of service users, staff or others touched by your organisation, are a vital ingredient for most charities’ marketing. They put a human (or sometimes cute animal) face to the aims, objectives and statistics. Including case studies, particularly when there are really good photos, can lift your annual report. Use them simply as quotes with a picture, or take space to tell a more detailed story. Either way, the aim is to get across the problem and your solution. To show challenge and change. Video comes into its own here for online annual reviews. Livability – Whether in the online version, or in the printed version, you can’t help but love the case studies the disability charity uses in its annual review. From the photos, that they are disabled is immediately obvious, but there are bright smiles and positivity aplenty. It gives the whole annual report an upbeat and heart warming tone. The report takes away the hesitation many of us have around disability. 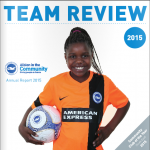 Albion in the Community – Football team Brighton and Hove Albion has its own charity which supports not only football development among under represented groups, but also runs employment, inclusion and education programmes. The report is entitled ‘Team Review’, but the team in question are various members of the community who have been involved with the charity. It’s a great play on the football connection, with a double page spread photo of the 11 individuals, all in Brighton and Hove kit, posing in the club’s changing rooms. We then meet each team member. From asylum seekers to disabled supporters, they’re all here; giving the reader the feeling that the charity – and the football club – really does value the community in which it resides.